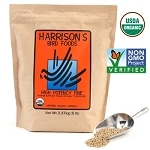 FOR USE IN BIRDS -- after completing a dietary program of High Potency Formula for a period of at least 6 months. 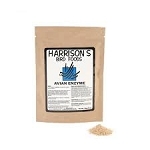 -- as a year round maintenance formula that meets the nutritional requirements for healthy, non-breeding birds including canaries, budgies (parakeets), cockatiels, finches and other small to medium parrots. Feeding Directions: --feed fresh food daily. -- to help reduce waste, feed as distinct meals. Use contents in 4-6 weeks. 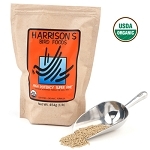 Ingredients: *Ground Yellow Corn, *Ground Hulless Barley, *Ground Hulled Millet, *Ground Soybeans, *Ground Shelled Peanuts, *Ground Shelled Sunflower Seeds, *Ground Lentils, *Ground Rice, *Ground Green Peas, *Ground Alfalfa, *Ground Toasted Oat Groats, Chia Seed, Calcium Carbonate, Montmorillonite Clay, Ground Dried Sea Kelp, Vitamin E Supplement, Sea Salt, Spirulina, Vitamin A Supplement, Vitamin D3 Supplement, Niacin Supplement, Vitamin B12 Supplement, Riboflavin Supplement, d-Calcium Pantothenate, Pyridoxine Hydrochloride, d-Biotin, Thiamine Mononitrate, Sodium Selenite. *CERTIFIED ORGANIC INGREDIENT Guaranteed Analysis: Crude protein (min.) 14%, crude fat (min.) 6%, crude fiber (max.) 4.5%, moisture (max.) 10%. 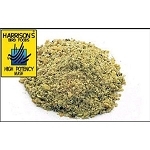 This review is about Harrison's mash product. 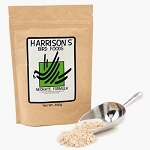 All the Harrison's products have worked well with my birds but the mash solved a specific problem for one of my birds. She vets fine, but has a chronic problem that caused me to almost lose her last winter. She had been receiving a diet of all organic, human grade fruits, vegetables and seeds which her flock mates did fine on. She needs moist food I discovered and what horse people call a mash made with Harrison's Mash and unsweetened almond milk did the trick. She is healthy and thriving now. 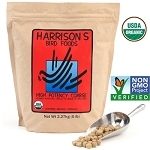 I am thankful to have this product available through the Bird Safe Store. 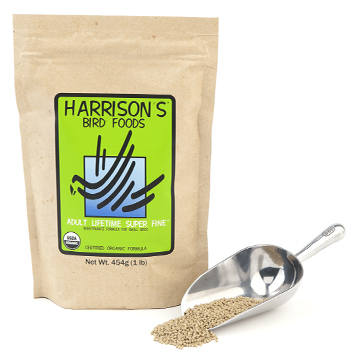 My birds like the Harrisons but the pellet size changes every now and then and they rebel and don't want to eat it. These size changes are a real problem. I wish there was something they could do about it. I love my bird so I love to feed her the best food I can. That's why I feed her Harrison's bird food. The customer service at the Birdsafe store is also wonderful. Rocky is a 2 year old cockatiel who I bought as a very young fledgling just old enough too leave the clutch. He is a sweet spoiled little guy who feels good because he is getting all the goodness he needs! Thank you for a good product! Q: My bird is a turquoise fronted Amazon she is 30 years old. We are trying to have her switch from seed to pellet.not sure what to give her? She was recently sick, the vet gave her your high potency food. She really likes it.not sure if that should be used as a regular diet? A: That would be a question best asked of your vet, but I would think you would start an Amazon on High Potency Coarse and then after 6 months switch to Adult Lifetime Coarse.